Operation of the Florida East Coast Railroad Bridge across the New River in Fort Lauderdale was the subject Wednesday night at a public meeting. About 100 people on Wednesday attended the first of three public meetings that the Coast Guard is holding on consecutive evenings to collect public comment on navigation through Florida drawbridges in connection with a proposed high-speed passenger rail service. The first meeting involved the operation of the Florida East Coast Railroad Bridge across the New River in Fort Lauderdale. “The meeting was well attended and I’d guess about 75 people spoke, nearly all expressing concern about the future of the bridge,” Marine Industries Association of South Florida executive director Phil Purcell told Trade Only Today this morning. Purcell said those who attended Wednesday’s meeting in Hollywood, Fla., consisted of people from the marine and real estate industries and end users — boaters. The primary marine concern is a potentially dramatic reduction in the navigability of South Florida rivers striped with drawbridge crossings because of the bridge closings the high-speed rail service would require. The proposed express rail service would start in Miami and end at Orlando International Airport, with intermediate stops in Fort Lauderdale and West Palm Beach. All Aboard Florida proposes to operate hourly service from 6 a.m. to 9 p.m., with 16 trains running in each direction daily — 32 a day. That’s probably two an hour crossing the St. Lucie railroad bridge and it does not include the freight trains from the ports of Miami, Fort Lauderdale, Jacksonville and other cities that use the Florida East Coast Railway Co. tracks. Navigability of the New River requires that the bridge in Fort Lauderdale be open for the majority of the time, the MIASF says. The majority of the boatyards in Broward County are west or upstream of the bridge. 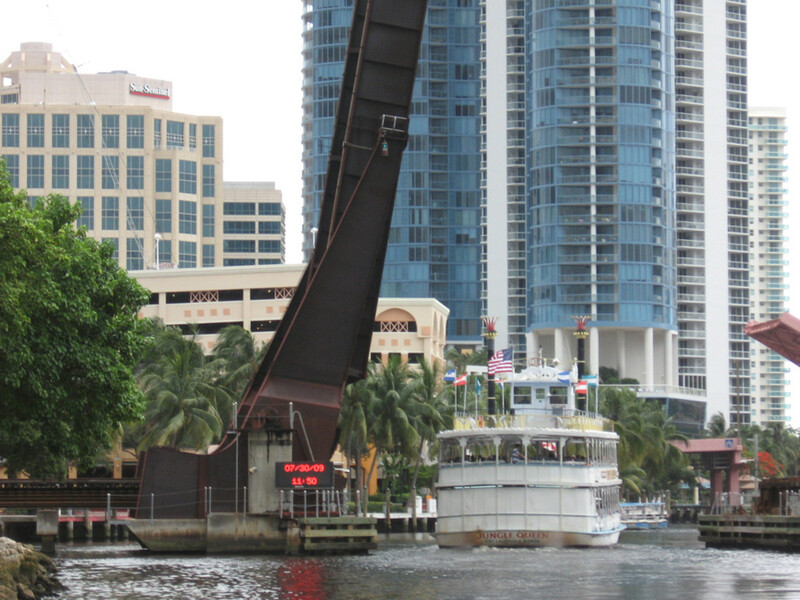 Purcell said the antiquated bridge in Fort Lauderdale, which sits just 4 feet above the river when it’s down, is now open most of the time during the busy daylight hours. An increase in closings or a failure of the bridge would disrupt vessel traffic and affect businesses that are dependent on the river, the MIASF says, adding that a draft environmental impact statement by the All Aboard Florida High Speed Rail project has the bridge closed 50 percent of the time, not including failures. The Coast Guard will hold an additional public meeting on the navigability issue tonight from 5:30 to 8 p.m. on the St. Lucie River crossing at the John F. Armstrong Wing Auditorium of the Blake Library, 2351 S.E. Monterey Road, in Stuart. The final Coast Guard meeting — on the Loxahatchee River crossing — is slated for Friday night from 5:30 to 8 p.m. at the Jupiter town council chambers at 210 Military Trail. “I would expect each to be well-attended, but they are different bridges in different communities, with different wants, needs and solutions at each of these meetings,” Purcell said. Comments specifically regarding the rail proposal’s effect on navigation through the New River, St. Lucie and Loxahatchee River drawbridges can also be sent via mail to the Coast Guard 7th District, Brickell Plaza Federal Building, 909 S.E. 1st Avenue, Suite 432, Miami, FL 33131; via fax at (305) 415-6763; or email at USCGD7DPBPublicComment@uscg.mil. A Dec. 1 deadline for comments could be extended, according to the Coast Guard. All comments submitted at the meetings will be used to develop new Coast Guard rules, which will be published in the Federal Register.